Billboard displays, Posters , Pocket Folders, Banner Ads, Graphic Designs, Press Releases, Magazine Ads, Promotional Sales items, Signs and more. Click on headings below to see samples. A 5-10 page brochure just might what your business needs to get an edge on the competition. 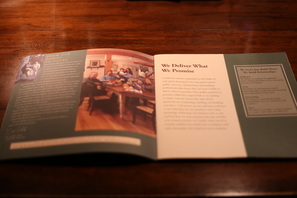 Cool Bull Productions will craft an attractive full-color booklet like the one pictured here to help highlight your company history and services.